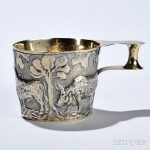 silver cup | Skinner Inc. In preparation for Season 6 of the HBO hit fantasy drama Game of Thrones, I recently began re-watching some earlier seasons (Who can remember everything otherwise?). Low and behold, I noticed something I never had previously in the first episode of Season 5, “The Wars to Come”. Being the art history nerd that I am, it was not another subtle plot point I missed the first go around, but a gold cup. Have you ever watched Antiques Roadshow on PBS? As a senior art and antiques appraiser at Skinner, many of my days are a lot like the reality TV show. I spend considerable time meeting with prospective consignors at our Marlborough and Boston auction galleries and viewing the antiques, collectibles & fine art brought in for an auction evaluation.